Fernando Rojas has spent his life living by a large lake in central Chile. About seven years ago it began to shrink, and now most of the water is gone. He holds a photo taken when the lake was full. His picture shows a lake, brimming with water, in front of a range of hills that are silhouetted by the sun. In the foreground, by the water's edge, there's a small boat, ready to set sail. Next to that, there's a wooden jetty, jutting out into the waves. There is nobody who has not been affected by climate change, directly or indirectly, here in Chile. Most of the water has gone. The jetty is marooned in a sea of mud and grass. Beside it, there is a new wire fence, erected to keep out horses and cattle that are grazing on the lake's bed. Some boats are still there, stored away under canvas. The Laguna de Aculeo — as this lake's known — used to be a favorite retreat for many of the 7 million citizens of Chile's capital, Santiago, 45 miles to the north. A dock rests in a dry waterbed in central Chile. 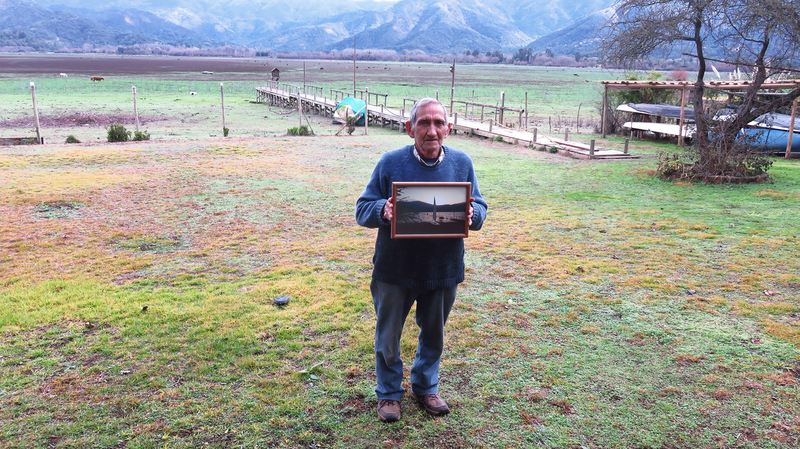 For much of his life, Rojas farmed around the lake, growing melons and corn. He says the lake, which depends entirely on rainfall, began to shrink about seven years ago, and "got lower and lower and lower." The lake was roughly four times the size of New York's Central Park. Rojas used to motor across it in a small boat to buy groceries. That same journey is now a walk. Lakeside villa prices collapsed — "no one wants to buy them, if they are not beside the water," he remarks — and so have parts of the local economy. Ana Varas lives in the countryside of central Chile. 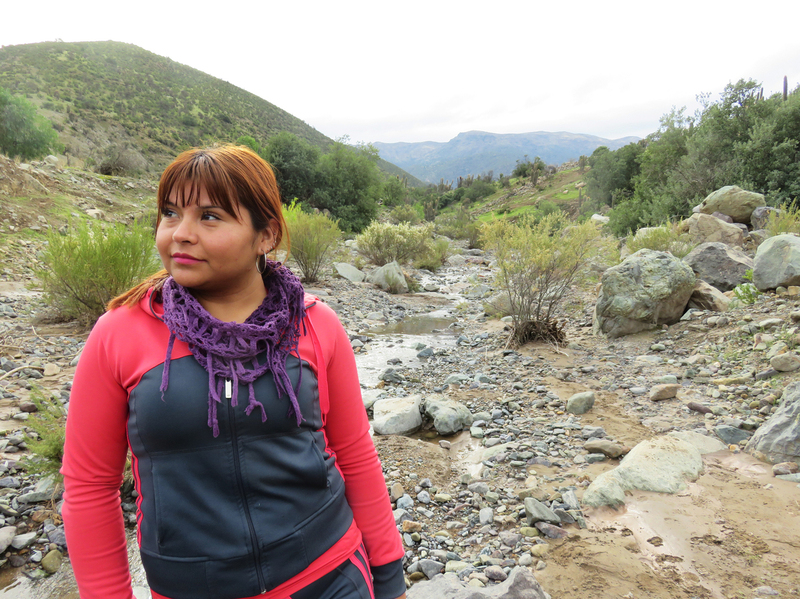 She is standing by the river that supplied the nearby gold mine where her husband worked. It went completely dry because of the drought. Local people are "suffering [because] they depend on the water," says Claudio Mella, an orthopedic surgeon in Santiago, who owns one of the villas and has been coming to the lake with his family for 15 years. "We have a lot of good friends here, and many of them have some depression, some family problems." Among those dependent on the lake is Oriana Lopez, who's 55. Her once-thriving windsurfing business has received no clients for about five years, she says. Her family is left "in penury," and must survive on her 97-year-old father's pension, plus whatever money her son can earn doing casual labor. "It is pitiful to see the lake like this," Lopez says, as her dogs romp across what used to be the lake's bed. Many people have had to leave the area, because of the lack of jobs. She, however, will stay and struggle on. "I was born and raised here," she says tearfully, "I love this land." "We have been calling it the mega-drought because it has been very extended in space and in time," says Maisa Rojas, a climatologist from the University of Chile. "We have seen this before, but never so widespread." Although there has been a recent increase in precipitation, scientists are not yet sure if the drought's over. Studies are now underway investigating ways of saving the lake. "If nothing is done, it is possible the lake will dry out in a couple of years. It's on the edge," says Felipe Martin, a leading hydrologist who used to head the commission that develops Chile's water resource policy. Martin is among those working on rescue plans. 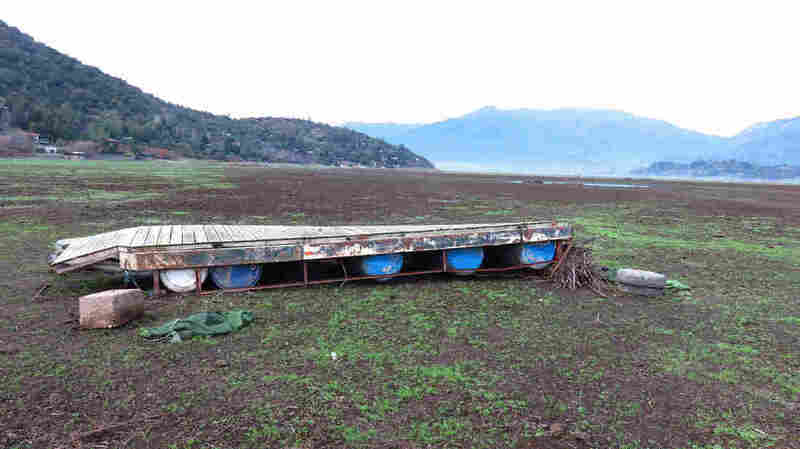 He says the lake lost some water after its aquifers were disrupted by Chile's 2010 earthquake. But drought is a major factor, and he blames that on climate change. "There is nobody who has not been affected by climate change, directly or indirectly, here in Chile," says Matias Asun, director of Greenpeace Chile. Chile's Environment Minister, Marcelo Mena, cites "temperature anomalies" of 2 degrees Celsius in parts of Chile, and says there is "no space for climate denial because we see climate change threatening us in multiple shapes." Mena points to a wave of disasters that has hit Chile recently, including deadly floods and landslides, and a giant "red tide" — when an algae bloom, fueled by unusually warm sea temperatures, wiped out millions of fish, including 20 percent of the salmon production. In January — fed by drought conditions — the worst wildfires in Chile's history ripped across the landscape, destroying more than 2,300 square miles, including large areas of forests, and threatening some of the country's famous vineyards. 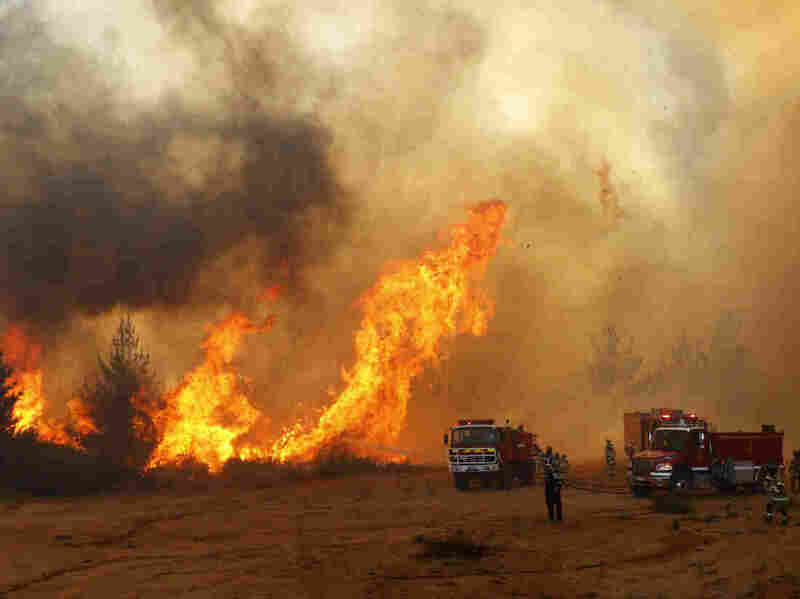 Firefighters work to put out a forest fire in Valparaiso, Chile, in March. "When you see the desperation in people's eyes, and when you see things that you haven't seen before, that really makes you worry that this is really getting out of hand," Mena says. "And when you see that some people are trying to deny the climate science, then ... you have to take your gloves off, and you have to be very blunt about the fact that we are facing a challenge that is like something we have never seen before." Proving that Chile's wave of catastrophes was caused by climate change is highly complex. You have to use modelling studies to show any given event would have not have happened, were it not for climate change, says climatologist Maisa Rojas. "We haven't done any attribution studies for this, so I cannot say event[s] wouldn't have happened, if it weren't for climate change," she says. "But the climate context in which these events have occurred are very much what we'd expect from climate change." Chile's government is introducing a range of measures to help the country adapt to hotter, drier conditions — for example, better water conservation and fire prevention methods, and creating green spaces to help cool urban areas. To further raise awareness, there will be mandatory climate change classes in Chile's schools, from next year onward. Chile's also rapidly expanding its use of renewable sources, which are expected to generate at least 80 percent of its energy by 2050. More than half the electricity used to power Santiago's subway system will soon come from the sun and the wind. The lion's share of this will be generated by a giant solar plant in Chile's Atacama Desert, using hundreds of thousands of solar panels covering an area the size of 370 football fields. 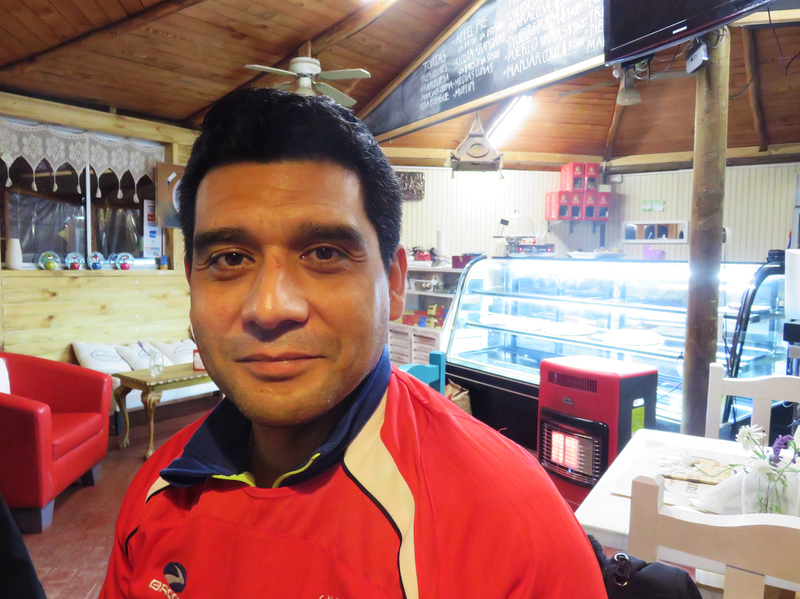 Paulo Gutierrez quit a lucrative technology job to set up a cafe and bakery near the Laguna de Aculeo. Paulo Gutierrez quit a high-pressure job in information technology and telecoms in Santiago to move to the lake with his family in search of a more tranquil way of life. He set up a cafe and a bakery around the time the lake's water levels first began to drop. He is now is considering buying land further south, and moving there. "We already know this thing is true, because we are suffering," he says. "Twenty years ago, it was a possibility. Right now, it's a reality."